Flying well-dressed mannequins in a 6 story atrium and spinning stylish mannequins on a 32 foot (10 meter) carousel is what shoppers experience when they enter the Uniqlo flagship store in Shanghai. 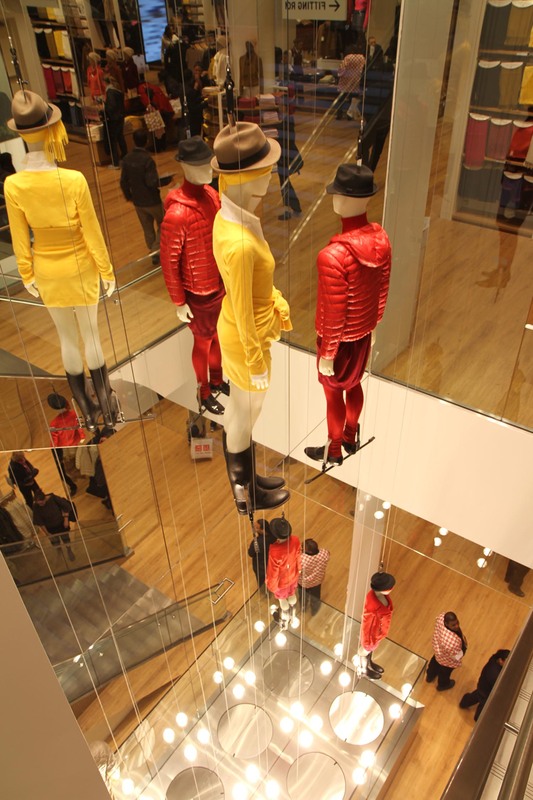 Similarly, twirling mannequins are the ‘show’ that shoppers are treated to when climbing 3 stories of stairs in the recently opened Uniqlo flagship store in New York City. “It’s bringing life and movement to the otherwise static world of retail clothes modeling,” says Robert Dean, Founder of ZFX Flying Effects, Inc., with offices in the U.S. and Europe. “In this day of over-the-top entertainment, it seems that shopping has also become more about the multi-dimensional experience than about just buying new clothes. The store becomes the stage where we are seeing more and more theatrical techniques being used to engage the customer. It is a concept that has been embraced by European retail designers, and is just now entering the United States as more megastores are being built. ZFX worked with global architecture firm, Bohlin Cywinski Jackson to concept the Shanghai store’s displays. 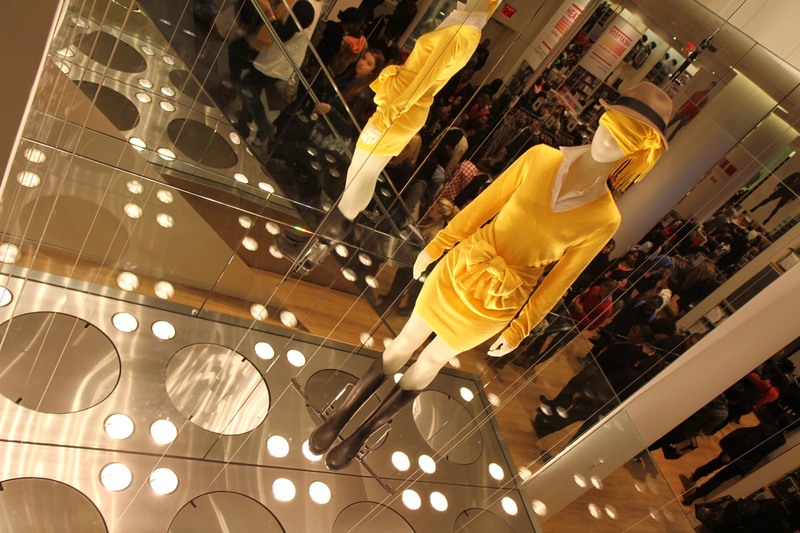 Not only do the mannequins fly through the 6 story atrium, but they spin so that shoppers can see a 360-degree view of the clothing being displayed. The project was a unique engineering challenge as the mannequins had to fly in each other’s flight space to create the visual spectacle. A flight plan had to be crafted that allowed the mannequins to fly at angles around each other. “With so many wires and mechanicals and lights, accuracy was essential,” says Dean. ZFX was able to pull off the engineering feat and since May, 2010, Shanghai shoppers have been marveling at the flying mannequins 12 hours a day, 7 days a week. A second component of the project in Shanghai is an overhead 32 foot (10 meter) diameter turntable with 18 mannequin pods suspended and rotating above the shelving. A curved i-beam track was designed and constructed and the carousel was installed on the track. The result is a dynamic display that captures the eye with its constant motion. Starting in Las Vegas as a theatrical flying effects company in 1994, ZFX has seen the growth of the flying industry expand far beyond the theater world into all aspects of the entertainment industry globally. Not only does ZFX fly monkeys worldwide for the Broadway phenomenon Wicked, it is most recently seeing the expansion of its services into non-traditional venues, such as the Uniqlo projects. More photos and information about ZFX Flying Effects, Inc. can be seen at http://www.zfxflying.com. About ZFX Flying Effects, Inc. Founded in 1994, ZFX has delivered a fresh perspective to the ancient craft of flying effects by using a dynamic style. ZFX quickly became an industry leader and the top flying effects company in the world, with offices on two continents. ZFX has proudly grown to nearly 50 full-time employees around the globe who are experts in their craft including flying directors, flying producers, choreographers, designers, and even performers. ZFX is also a fabricator of original flying equipment including the eZ Hoists, harnesses, ZFX O-Gauges, Handy Blocks and even fairy dust. To make contact, please call (502) 637-2500.